Put the Pathfinder Roleplaying Game rules at your fingertips! 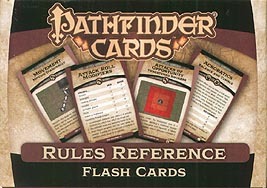 Whether you're a Game Master who needs a convenient reference for combat manoeuvres, a player who wants summaries of how to use your favourite skills, or a newcomer trying to learn the rules, this 110-card deck features concise guides to essential concepts from the Pathfinder RPG Core Rulebook and Pathfinder RPG Advanced Player's Guide on handy double-sided cards. Stop flipping back and forth through rulebooks - grab the cards you need and keep your game moving!